Air Vice Marshal P Subhash Babu, Assistant Chief of Air Staff (Financial Planning), Air HQs, New Delhi visited Kakinada, East Godavari District of Andhra Pradesh yesterday to participate in the closing ceremony of National Integration Camp of NCC. He was the Chief Guest in the function held at JNV, Peddapuram, Kakinada. Addressing NCC cadets he congratulated the cadets from various states from Kashmir to Kanyakumari and Nagaland to Mumbai who had the opportunity to stay together, play together learning each others’ customs, traditions and culture. He felt that such integration camps bring people together and make them appreciate the cultural, linguistic diversity of the nation. Earlier, NCC cadets presented guard of honour to Air Vice Marshal. Cadets from different states staged colourful cultural performances of their respective states that enthralled the audience. 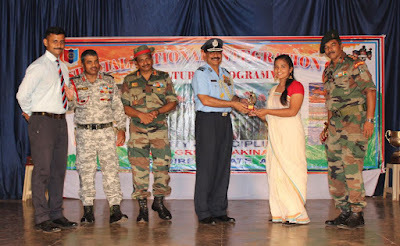 The Chief Guest gave away prizes to the winners in various competitions held during the camp. Besides distinguished guests, large number of students, academicians, armed forces participated in the closing ceremony of the National Integration Camp.